In the early hours of August 13th 1961, the government of East Germany ordered the closure of all borders between East and West Berlin. As the sun rose, Berliners were awoken by the sound of trucks, jackhammers and other heavy machinery. Watched by Soviet troops and East German police, workmen began breaking up roads, footpaths and other structures, before laying thousands of metres of temporary but impassable fencing, barricades and barbed wire. They worked for several days, completely surrounding the western zones of Berlin and cutting them off from the city’s eastern sectors. Within three days, almost 200 kilometres of fence line and barbed wire had been erected. The East German government’s official name for the new structure was Die anti-Faschistischer Schutzwall, or the ‘Anti-fascist Protective Wall’. It became known more simply as the Berlin Wall. According to East Germany, the Berlin Wall was erected to keep out Western spies and stop West German profiteers buying up state-subsidised East German goods. 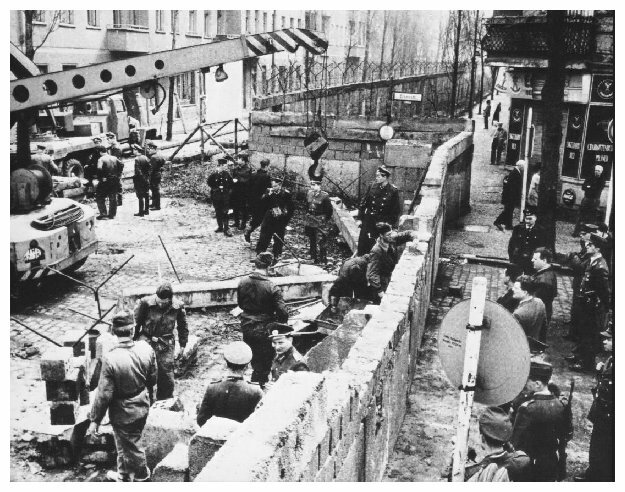 In reality, the wall was erected to stop the exodus of skilled labourers and technicians from East to West Berlin. The erection of the Berlin Wall made headlines around the world. For the Western powers, it was not entirely unexpected. The United States and West Germany immediately went on high alert, in case the events in Berlin were a prelude to a Soviet-backed invasion of the city’s western zones. 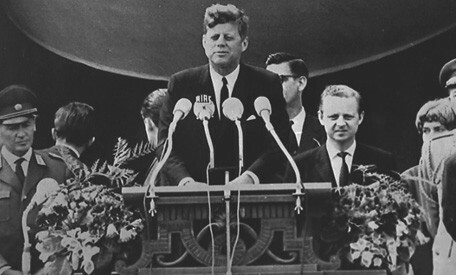 Six days later, US president John F. Kennedy ordered American reinforcements into West Berlin. More than 1,500 soldiers were transported into the city along East German autobahns (unlike in the Berlin Blockade, access to West Berlin through East German territory was not blocked). To prepare for another Soviet blockade, Kennedy also ordered a contingent of US cargo planes to be sent to West Germany. Some experts considered the Berlin Wall an act of aggression against Berliners in both zones and demanded strong action. Kennedy was more sanguine, suggesting that a wall “is a hell of a lot better than a war”. As weeks passed, the Berlin Wall became stronger and more sophisticated – and also more deadly. 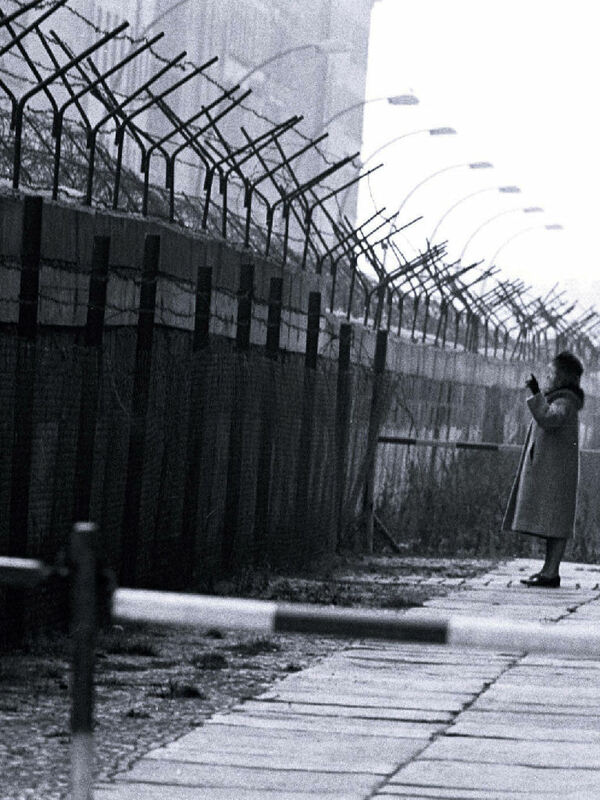 By June 1962, the East Germans had erected a second line of fencing, approximately 100 metres inside the first wall. 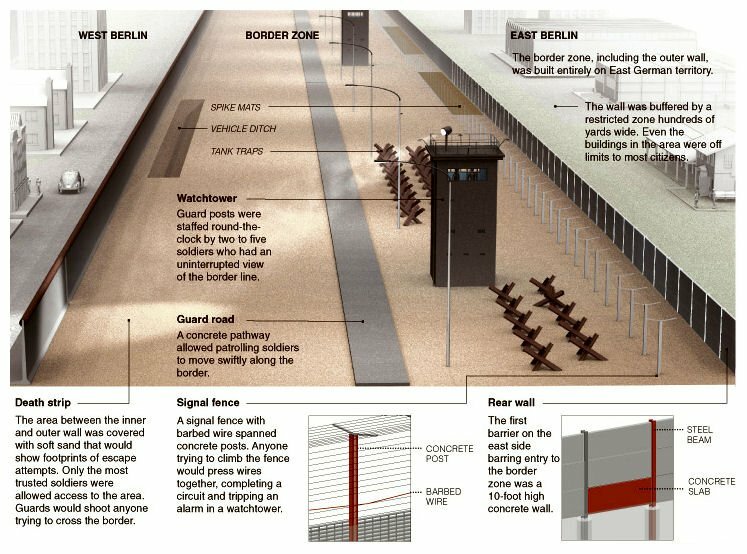 The area between both fences was called ‘no man’s land’ or the ‘death strip’: under East German regulations, any unauthorised person observed there could be shot without warning. Houses within the ‘death strip’ were seized by the East German government, destroyed and levelled. The area was floodlit and covered with fine gravel that revealed footprints, which prevented people from sneaking across unnoticed. Structures that overhung the ‘death strip’, like balconies or trees, were booby-trapped with nails, spikes or barbed wire. In 1965, following several escape attempts where cars or trucks were used to punch through the fenceline, many sections of the barrier were replaced with pre-fabricated sections of concrete. This 3.4-metre high concrete barrier became the Berlin Wall’s most visible feature. Needless to say, crossing the border between the two Berlins became even more restrictive. Prior to the late 1950s, it had been comparatively easy for West Berliners to visit relatives in eastern sectors, using a day pass issued by East German authorities. Travelling in the other direction was more difficult. East Berliners wanting to cross the city had to show a government permit, and these were difficult to obtain. Elderly East Berliners found these permits easier to obtain because their potential defection was not detrimental to East Germany’s economy. Those with business ties or immediate family in the West could be granted permits – though these permits were often denied or revoked without reason. Permit-holders could cross the Berlin Wall at several points, the best known of which was ‘Checkpoint Charlie’ in Friedrichstrasse. There were, of course, many attempts to cross the wall illegally. Some tried climbing, scampering or abseiling over the wall – however, the fortifications, barbed wire and armed Grepo (border police) made this a dangerous activity. Ramming through the wall or checkpoints in vehicles was a common tactic in the early years of the wall. This tactic was nullified when the East Germans rebuilt all roads approaching the wall as narrow zig-zags, preventing vehicles from accelerating. Others tried tunnelling under the wall or flying over it, using makeshift hot-air balloons, with varying levels of success. Around 230 people died attempting to cross the Berlin Wall. In 1962 Peter Fechter, an 18-year-old East German factory worker, was shot in the hip by a border patrol. Fechter bled to death in the ‘death strip’ while helpless onlookers on both sides watched impotently. Siegfried Noffke, who had been separated from his wife and daughter by the wall, dug a tunnel underneath it, only to be captured and machine-gunned by Stasi agents. The Berlin Wall stood in place for almost 30 years. It remained the most tangible evidence of the Cold War and Iron Curtain separating the Soviet bloc from the West. Western leaders often referred to it as a symbol of Soviet repression. US president Ronald Reagan visited West Berlin in June 1987 and urged his Soviet counterpart, Mikhail Gorbachev, to “tear down this wall“. It was the people of Berlin themselves who tore it down, during a public demonstration in November 1989. 1. The Berlin Wall was erected by the East German government in 1961. It was constructed to halt the exodus of people, particularly skilled workers, from communist East Berlin. 3. The West condemned the Berlin Wall and exploited it as anti-communist propaganda. The wall was evidence, they said, that Soviet communism was failing and East Germany was now a prison state. 4. Over time, the Berlin Wall was heavily fortified, booby-trapped and policed by armed guards. Despite this, many Berliners tried to cross it, and around 230 were killed in the process. 5. The Berlin Wall would stand for almost three decades as a tangible sign of the Iron Curtain and the divisions between the Soviet bloc and the democratic West. The political changes of the late 1980s, the weakening of the East German government and a popular uprising led to the Berlin Wall being torn down in November 1989. 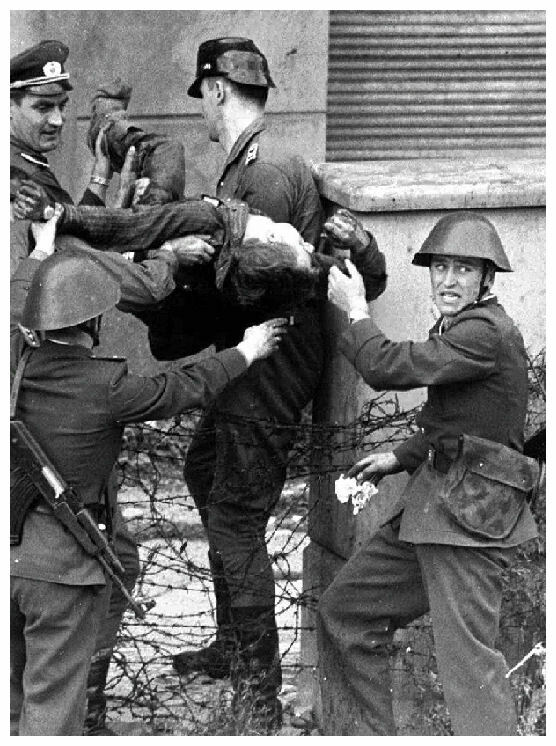 J. Llewellyn et al, “The Berlin Wall”, Alpha History, accessed [today’s date], https://alphahistory.com/coldwar/berlin-wall/.